Add an Authors callout with a list of authors to the Quick Help for a symbol. The order of the authors in Quick Help is the same as the order they appear in the delimiter. Multiple Authors delimiters are added to Quick Help in the order that they appear in the markup. 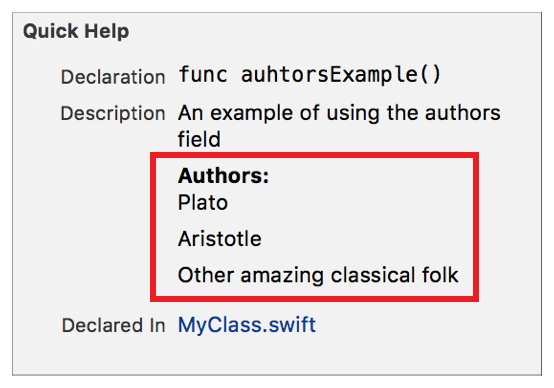 Use the callout to display the authors of the code for a symbol. The author names displayed in Quick Help are created as described in Returns Section. There is an empty line between each author name. Use the Author delimiter for a single author.